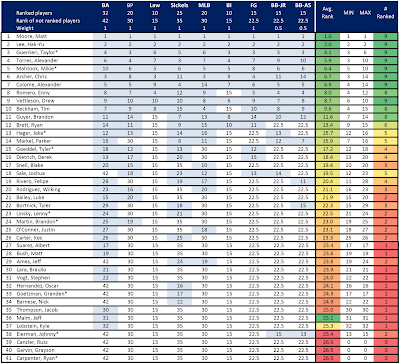 UPDATE: Now with BA-Top 30 (via Marc Topkin and DRaysBay) instead of Top 10. After Marc Hulet (of FanGraphs) and Kevin Goldstein (of Baseball Prospectus) have also published their Rays Top Prospect Lists, I'm going to post the final Aggregated Industry Rays Top Prospect List. I'm also comparing this industry list with our own Rays Top Prospects-list. I aggregate the Rays Top Prospect Lists of 9 acknowledged industry sources into an aggregated list. The sources are: Baseball America, Baseball Prospectus (Kevin Goldstein), Keith Law (ESPN), John Sickels (MinorLeagueBall.com), Jonathan Mayo (MLB.com), Baseball-Intellect (Source: Prospect Spreadsheet by FantasyRundown.com ... excellent source by the way), FanGraphs (Marc Hulet probably), Bullpen Banter (2 lists: Jeff Reese and Al Skorupa). In the following table you can see all the players listed who either cracked at least one of those 9 lists or who are on our Rays Top 30 Prospect List. Overall, that makes 34 players listed (including Russ Canzler who is no longer with the organization). Players who were not listed on a single prospect list got the value of the last ranked player times 1.5. (e.g. : on BA's Top 10 Prospect List every unranked player got a "ranking" of 10*1.5 = 15). Each of the Bullpen Banter lists was weighed with 0.5. We much more believe in Enny Romero's potential as a starter than the industry sources do (RP: 3rd, Industry: 8th). He is as much a controversial player as Alex Torres, Chris Archer and Alex Colome. Either you project them as starters or as relievers. On the other side, they like Alex Colome more than we do (RP: 11th, Industry: 7th). Nevertheless, both aggregated lists have the same top 11 prospects. The biggest differences are with Taylor Guerrieri (RP: 6th, Industry: 3rd), Alex Colome and Enny Romero. After that, both lists have the same players in the range from 12 to 16. 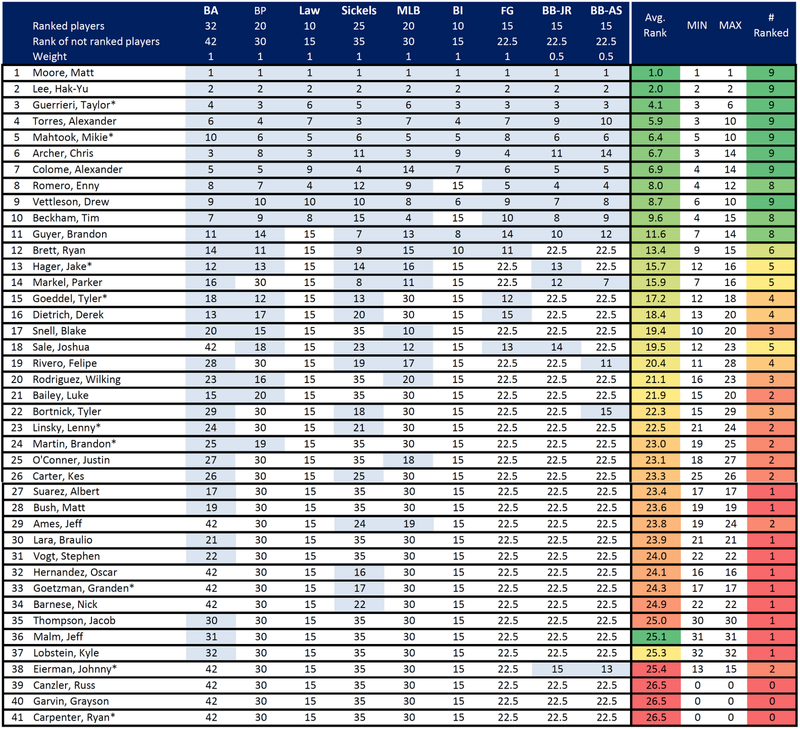 Blake Snell (17 overall), Wilking Rodriguez (20) and Luke Bailey (21) are the highest ranked players according to the industry lists, not on our RaysProspects - list. The other way around, Ryan Carpenter (21st on our list) and Grayson Garvin (25) are not mentioned on ANY of the industry lists. BurGi, maybe I missed it, but why don't you just use all of BA's top 30 (really 32) instead of just the top 10? Seems like it would be more accurate than just giving all those other guys a "15" ranking. Guess you could give Sickels "others" something too. Anyway, love the chart, just wondered. I'll put it under the TOP PROSPECTS tab so everyone can find it whenever they want. Thx, Doug. I totally forgot about the BA Top 30. It's included now. At the beginning I had a rank for JS's Honorable Mentions but I dumped it because the list of prospect would've been too long by that time. Now, everybody on my list (except Suarez and the parted Canzler) is at least on Sickel's Honorable Mentions. Therefore, I keep it the way it was, not including the 4-5 players honorably mentioned but not in any ranking (sorry Marquis Fleming, Todd Glaesmann, Kyeong Kang, ...). Looks great BurGi. For anyone who is interested you can find the complete BA list plus their lists going back to 1998 under the Rays Top Prospects tab at the top, just scroll down. Sickels lists going back to 2008 are also on their, below the BA lists.